Apartheid was first used to refer to the racist policies of South Africa after 1948, but it has a much wider scope. It has been found internationally to be a crime against humanity. Palestinians have been suffering for the past hundred years from the efforts of another people to take over their land. They have suffered hugely from the racism, disregard and cruelty of the people taking over the land – as indigenous people have from settler colonialism in other times and other parts of the world. The settlers in Palestine have not come to live with the Palestinian people, but to attempt to replace them, and the racism and discriminatory treatment that the Palestinians suffer is systemic and deep. The Israelis have been very clear about their project, which is to build Israel as a land for Jews. This has led them to classify people wherever they are – in ‘1948’(Israel), in the West Bank, in Jerusalem, in Gaza – as different from each other and with different rights. Sometimes they allow them more or less rights than each other, but always with the main division: Jews/ Israelis on the one hand and Palestinians on the other. The situation between Palestinians and Israelis in ‘1948’ (as the Palestinians call it)/ Israel is of systematic inequality. Palestinians are labelled ‘Israeli Arabs’ and defined as ‘non-Jews’ and they do not enjoy the rights that Jewish Israelis have – they have not got the same access to housing areas, to benefits etc, and a quarter of a million of the Palestinians in Israel are internal refugees, living close to their villages but not allowed since 1948 to return. Palestinians there, unlike Jewish Israelis, do not have the right to bring their spouses or even their parents who were born there to live with them – the state that they are living in, defined as a Jewish state and now with a Nation-State law, has said that it is not a state for them. In Jerusalem, Israel has given Palestinian residents IDs as residents but not as citizens. They are not able to build (and houses are often knocked down or taken over) although they are increasingly under pressure from Israeli settlers’ building developments. In Gaza, Israelis had settlements until 2005, when those settlers moved out to the West Bank; Palestinians in Gaza are completely separate from everyone else, effectively prisoners in a small piece of land. In the West Bank, the Israelis have built their settlements (‘colonies’ in many other languages) close to Palestinian homes and on Palestinian land, but they are closed from Palestinians, encircled by military defences and served by settlers’ roads that are in many cases not free for Palestinians to use. The two groups of people live separate lives. Palestinians encounter Israelis as soldiers, members of the occupation administration encounter them as settlers, protected by the soldiers and often armed themselves. The image below lays out the contrasts in treatment of Palestinians and Israelis in the West Bank. The settlers live a luxurious life-style within sight of the Palestinians who are not allowed control of their own resources. The comparison between the settlers’ lives and the lives of the nearby Palestinians is dramatic. The settlers have first call on the resources of the area and each settler has access to about 6 times as much water as a Palestinian – The settlement is full of watered lawns, swimming pools and fountains while the Palestinians are struggling with lack of water, particularly in the summer. The settlers have plenty of opportunities of every sort – education, health services, employment, protection, ability to build or develop the economy, access to resources that remain a huge struggle for the Palestinians living under occupation. The settlers have access to their human rights, while the Palestinians’ rights are systematically violated. The settlers may come from Israel or may come from abroad because of the ethnic difference that Israel has created. Israel allows and encourages Jews from all over the world to move to Israel and the West Bank, but at the same time it ignores international resolutions and human rights and refuses to allow the Palestinians who were pushed from their land in 1948, 1967 or at other times to return. Thus there are people from the US and other places living on Abu Dis land in Maale Adumim while approximately two-thirds of the people of Abu Dis are in Jordan or elsewhere and unable to return or in some cases even to visit. 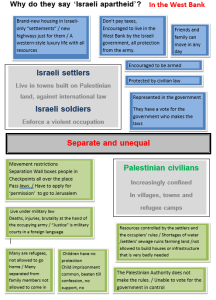 The differences between the Israeli settlers and the Palestinians under occupation are built into Israeli law. Israel has full civil rights for its own people and has moved over half a million of its own people into the West Bank and Jerusalem where they are living right next to (sometimes above or next door to) Palestinians who are not given such rights. Palestinians are governed by Israeli military law and Israeli settlers are governed by Israeli civil law. This means different treatment at every stage, much crueller and rougher for the Palestinians than for the Israelis whose rights are protected. The Palestinians in Jerusalem pay big taxes to the Israelis (the ‘arnona’) but do not get the same level of municipal services that the Israeli parts of town receive. Palestinians in the West Bank pay huge amounts in tax to Israel, some in relation to land, part of the money taxes from work, taxes on services and goods in the market – ) and thousands of shekels of fine of all sorts go to Israel too. However this taxation is very far from giving them representation! The government that is creating this situation is not the Palestinian Authority in Ramallah but the Israeli Knesset. Israel makes claims to be a democracy – which involves government by the people – but it does not regard all of the people of the land it controls to be equally worthy to have a vote. Within Israel, military law was lifted from Palestinians in 1966 (18 years after Israel was established and the year before the occupation of the West Bank, Gaza and East Jerusalem). After that time, Palestinians (called by the state ‘Israeli Arabs’) were given the vote, but life is made very difficult for Palestinian politicians or political parties that want to challenge the racist divisions that affect their lives. Within Jerusalem, Palestinians are allowed to vote for the municipality only but not for the government or to change the laws. Within the West Bank, Palestinians have no say at all in the government that controls their lives. The Palestinian Authority was created after the Oslo Accords, but has only the power we in the UK would expect of a local authority – dealing with roads, rubbish, education – but all of these have tp be agreed with the real controller, Israel. The PA security has the power of a police force (with permission from Israel and in areas it accepts). But the authority does not have the power to change apartheid policy. The PA’s lack of power is illustrated by its dependence on the international community both to fund and to ratify its elections. There have only been elections in 1996 and then 2006 – and the government elected at that time was not wanted by the West so was frozen out by international sanctions. Gaza has been in a temporary state of emergency since 2007 – the situation is different from the West Bank. In 2005, Israel decided to control Gaza from outside and withdraw its settlers. In 2006, Hamas (a political party) won the PA election but following international pressure and sanctions, Fatah (another party) took over in the West Bank after the sanctions bit. Following unrest in Gaza between the two parties, Hamas is still in control of Gaza. Israel is enforcing a savage siege on the people in Gaza and their conditions of life are extremely poor. It is true here too to say that there is an apartheid division between the Israelis who control the area through fences, planes, rockets and snipers and the Palestinian people who are not in control of the government that controls their lives. And approximately 8 million Palestinian refugees have been kept out of the country and thus disenfranchised in relation to the country they still see as home (while new Israelis have the right to vote for the Knesset). The West Bank and Gaza were taken by military force by Israel in 1967. They are still under military rule. There are international laws (the Geneva accords) that prohibit the settlement of occupied land by the occupying power. Nevertheless, there has been huge take-over of Palestinian land and rapid building of new towns in the West Bank and, until 2005, in Gaza. These Israeli “settlements” are new towns specifically for Jews, not for people to live in together. There have been big efforts including subsidies to persuade Israelis to live there, and many of the settlers are not originally Israeli at all, but are from the United States, Russia or elsewhere and encouraged by the Israeli Law of Return. Palestinian refugees from 1948, 1967 and from all many deportations in between have not been allowed to return to Palestine, with the exception of some families with links to the Palestinian authority who were allowed to come back after the Oslo agreement f 1993. Palestinians living locally have been brought in to the settlements as labourers or else as prisoners (for example, young men from Abu Dis often see the inside of Maale Adumim police station) but they are not otherwise allowed to go there, and they certainly cannot live there. The settlements are military points, built usually on hilltops, fortified and guarded. Settlers are often armed, and there are many incidents of settler violence against local Palestinians, particularly where the settlement is fighting to expand. The facilities available to the settlements and to the Palestinian towns and villages are dramatically different. The settlements consist of Western-style housing, and have more electricity, more water, swift access on modern roads to Jerusalem. The Palestinian towns, villages and refugee camps are often in great hardship. The contrasts between the educational resources for the two groups of children are dramatic. People living in the settlements and in the towns have a separate road system. The smooth settlement bypass roads link the settlements and Israel. The poor-quality Palestinian roads are blocked intermittently by checkpoints, and efforts are being made to create tunnels and bridges ensure that the two road systems, already largely separate, are completely apart. Israelis in the settlements are on Palestinian land, but they and the Palestinians next door are judged by completely separate laws. A settler in trouble with the law is judged by Israeli civil law and civil courts. Palestinians are living under another set of rules. Following the Oslo agreement of 1993, Palestinians in the West Bank may be in an Area A, Area B or Area C. In Area A, there are Palestinian police. But in Areas B and C, there is no civil law for Palestinians, and all problems between people have to be sorted out between themselves by family networks and local people. Much more likely for Palestinians, in all these areas, is a problem with the Israeli army which has a policy of military arrests. This often brings local children as well as young adults into military courts, where they are tried in a language that is foreign to them. Palestinians are judged as adult at 16, where Israelis judge their own to be juvenile until 18. Israelis living in settlements have a vote in the Israeli Knesset elections. Palestinians have a vote for the Palestinian authority, although in fact the outside world determines whether the results of the election are acceptable, as the Palestinians discovered when they were punished by sanctions for their votes in January 2006. But the Israeli government is the one that controls the military, the settlement policy, the laws. So there is an ethnic division here too: Israelis living on Palestinian lands have a vote, but the Palestinians have no say in the government that determines their lives.